When Rutlands knocked a massive 33% off their price for the Dakota Deluxe Router Table - from Â£149.95 to Â£99.95 - I thought it was too good an offer to refuse and duly ordered one. It arrived flat packed in a box weighing 25Kg but following the instructions, 1 hour later the table was complete. The laminate covered MDF top is a generous 36mm thick and measures 600 x 810mm. It has a ? in hardened T track along its length that will accommodate feather boards, a mitre gauge and other homemade jigs. There is a phenolic insert plate that needs to be drilled to accept your router. 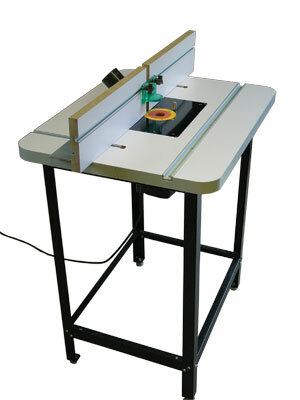 The plate has two insert rings that snap in place, to accommodate cutters up to 90mm diameter. Two additional holes are drilled in this insert that will take a lead on pin that comes with the table. The fence is made from hardened steel and slides along two aluminium T tracks and locks positively in place by means of two knobs. Two laminated MDF adjustable sub fences are attached to this steel fence by means of bolts running in aluminium T tracks. Additional T tracks run the length of the front of these sub fences so feather boards can be used to hold the work piece down to the table. A 63mm dust extraction port is attached to the back of the steel fence. The phenolic insert has a grub screw in each corner to adjust it and bring it level with the table top. These grub screws screw down onto four rare earth magnets located in the rebate of the table top. These hold the insert in place in the rebate and provide a hard surface for the grub screws to rest on. Disappointingly though, a check with an engineering square found that the fence was not at 90 degrees to the table. Further investigation showed that the steel fence was not machined at 90 degrees. However, this annoyance was easily rectified by inserting a couple of shims either between the steel fence and the table or between the steel fence and the sub fences. 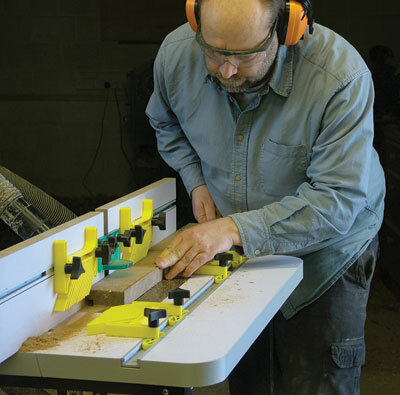 Having made these checks and adjustments and installed my router by drilling the appropriate holes in the table insert, I was ready to put the table to use. The table performed admirably, doing all I asked of it. The lead-on pin is a useful addition, allowing safe use of router bits with bearings. There is provision to fit a shelf on the lower rails and the whole frame can easily be boxed in using plywood, not only making the stand more rigid, but also providing useful storage space. All in all I think this table is excellent value for money, particularly at its current price. "I think this table is excellent value for money"